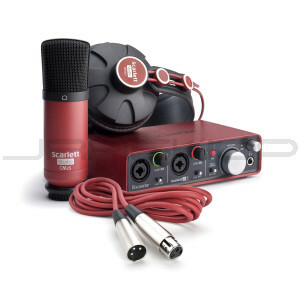 Whether you’re just starting out on your musical career or you’re a seasoned professional, Scarlett Studio gives you everything you need to start recording studio-quality music right away – right down to the microphone cable. Just add your computer. Focusrite has been making high-end recording systems, used in the world's top studios, for over 25 years. That same precision engineering is now available in a compact, high-quality system for you to connect to your computer and start recording now – and it’s all inside this box.